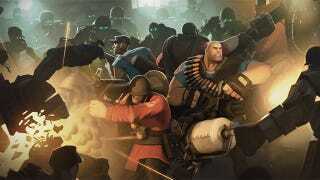 First revealed yesterday, Team Fortress 2's new Mann vs Machine mode threatens to be the biggest change the game has experienced in its five year existence. We've already seen the robots, now today, we see how the cartoon mercenaries are going to fight those robots. If you've played Call of Duty's zombie mode, you'll be right at home. For starters, every player now has a single slot for what's essentially a perk, with five different abilities to choose from, ranging from temporary invincibility to short bursts of never-ending ammo. Each class of soldier now also has specific tactics (see: abilities) they can uniquely use to slow down or destroy robots. Both of those things, as well as your weapons themselves, can be improved throughout a game by visiting an "Upgrade Station", where you spend money earned by killing on stuff to help you do more killing. If you're wondering where you'd find the time for this, remember: this is a wave-based game mode, so there'll be breathers in-between all the killing. Oh, Valve also took the wraps off a new map, called Coaltown. How do you get people interested all over again in a game that's five years old? Why, this is how. Mann vs Machine goes live on August 15.